Any valuation of visibility (including all the products of art and architecture) has a strong tie with a consciousness in the way of seeing. All subjective conversations about beauty and the picturesque make no sense if the state of mind (in terms of division thinking) is not properly indicated. Two-fold beauty is completely different from four-fold beauty. The consciousness of seeing can be transferred to a broader state of mind when the oppositional setting is conquered. This reflective condition implies a deeper understanding of higher division thinking – preferably up to the level of the quadralectic way of thinking. The latter approach is more specific than any other historical four-fold method, which is often used in a linear, numerological way and without the understanding of its cyclic-dynamic meaning. For instance, Aristotle’s four causes (or entelecheia: causa finalis, formalis, materialis and efficiens) are part of a four-fold system, but his teleological view (directed towards the causa finalis) has a linear tendency rather than a cyclic setting. The timeworn elements of Empedocles (fire, air, earth and water) or the medical humores (blood, yellow and black bile and phlegm) are recognized as part of a four-division, but the real dynamic meaning of such a division was not grasped. The system aimed at an equilibrium or balance between the (oppositional) components. A good example of the tension between the lower and higher type of division thinking can be found around the Pivotal Point in the European cultural history (the year 1500; see fig. 267). The perspicuous life of Michelangelo Buonarroti (1475 – 1564) epitomized the changes, which occurred at that time (HIBBARD, 1975). 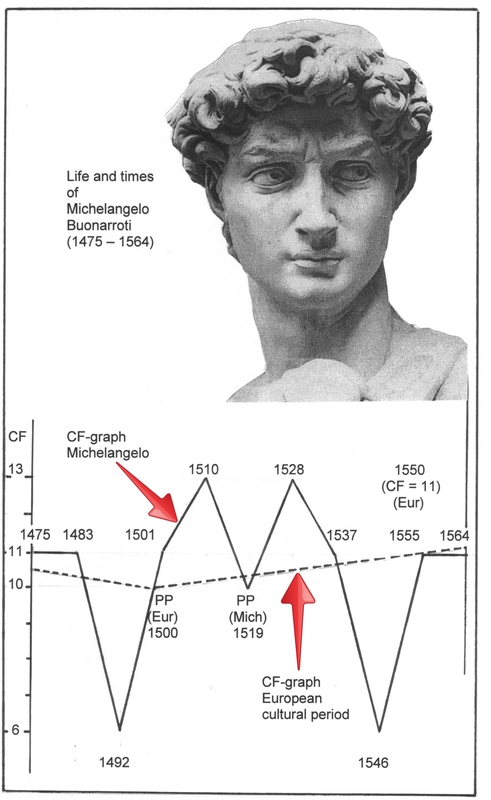 The CF-values of his life cycle of Michelangelo are given in fig. 822, with a graphic representation in fig. 823. Fig. 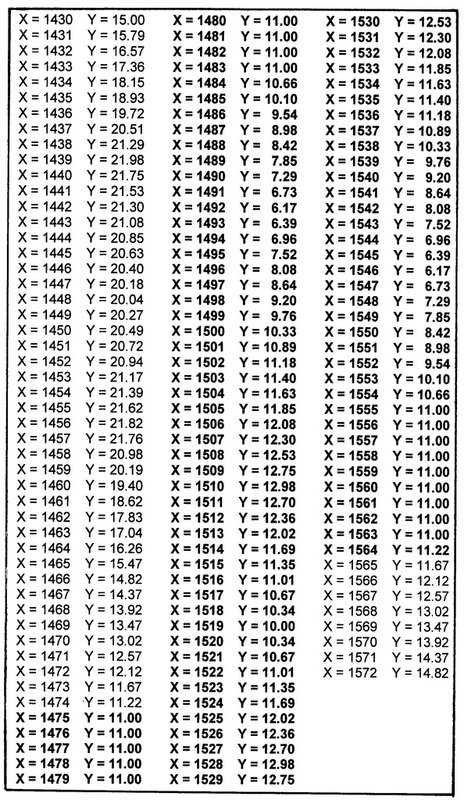 822 – The CF-values for the life cycle of the Italian ‘homo universali’ Michelangelo. These values include his visible presence between 1475 and 1564, indicated in bold print. Fig. 823 – The life and times of Michelangelo Buonarotti (1475 – 1564). The visible visibility area (X) on the CF-graph of his life is given here. Superimposed on this graph is the time-line (dotted line) of the CF-values of the European cultural history over the period of Michelangelo’s visible presence. PP is the Pivotal Point (1500) in the middle of the visible visibility area X of Europe. The city of Florence became engaged in political confusion and rivalry after the death of Lorenzo the Magnificent in 1492. His years of prosperity and materialism caused a deprivation of the spiritual powers in society. The immediate result was dissatisfaction. Strong leadership could not point the way to good fortune, and people got confused. The crisis was complete when the French King Charles VIII invaded Italy and seized Florence in 1494. He moved on to Naples and was only stopped by a coalition of Spain, the Holy Roman Empire, the pope, Venice and Milan. The spiritual leader and Dominican reformer Girolamo Savonarola (1452 – 1498) and his followers proposed a purely religious state with an ascetic and puritanical government. Contemporary painting was rejected and rare books and other works of art were burned. In this confusion of souls Michelangelo left Florence and went to Rome. There he started the marble sculpture of the Pietà in 1499 – 1500, in Saint Peter’s Basilica. The work, in all its beauty, transpires an expression of sorrow and resignation. Michelangelo returned to Florence in 1501 and the members of the Arte della Lana (Wool Guild) asked him to produce a statue of David (fig. 823 top). The 4.34 meters high marble was sculptured between 1501 and 1504 and is now in the Accademia (Florence). The Pietà and the David can be seen as the best representative works of the High Renaissance. Some years later Pope Julius II commissioned him to prepare his tomb and Michelangelo started with full enthusiasm on the sculptural project. However, Julius II changed his mind and decided to rebuild St. Peter’s to Bramante’s design instead. Michelangelo had to abandon the tomb-project and was given the immense job of painting the ceiling of the Sistine Chapel (1508 – 1512). He noted wryly: ‘After four tortured years, more than four-hundred over life-sized figures, I felt as old and as weary as Jeremiah. I was only thirty-seven, yet friends did not recognize the old man I had become.’ The themes of his painting still carry an oppositional message (God separating Light from Darkness, Creation of Adam and Eve, the Temptation and Fall of Adam and Eve and the Flood) but the Renaissance spirit had greatly diminished and was replaced by a new way of individual expression. It was only after five years of painting that he returned to the unfinished project of the tomb of Pope Julius. While working on this job he designed (in 1516) a façade for the church of S. Lorenzo in Florence, which was originally Brunelleschi’s work. He got the job and worked several years in the quarries to prepare the sculptural ornaments, maybe the happiest years of his life. The project met with some difficulties in 1520 and the contract was canceled. Instead he built a family chapel or mausoleum by S. Lorenzo (which was finished in 1534). By that time, he had mastered many of the skills of an architect. A further assignment of a library and anteroom to the library at S. Lorenzo proved his capacities. Now, Michelangelo was about fifty years old, and the times had changed considerably. The fairly rigid way of life in the pre-Pivotal years (before 1500) – with its strictly administered two-fold way of thinking – had resulted in new discoveries everywhere, not only in the arts, but also on the exploratory front of geography, science and social reform. The year 1500 was a turning point in the history of Europe-as-a-cultural-entity. Michelangelo noticed that the oppositional mind (re) created a new sense of awareness, but his artistic consciousness told him that this visibility was a prisoner of its own creation. Counter-Reformation and Mannerism were efforts to brake through this stagnant situation. 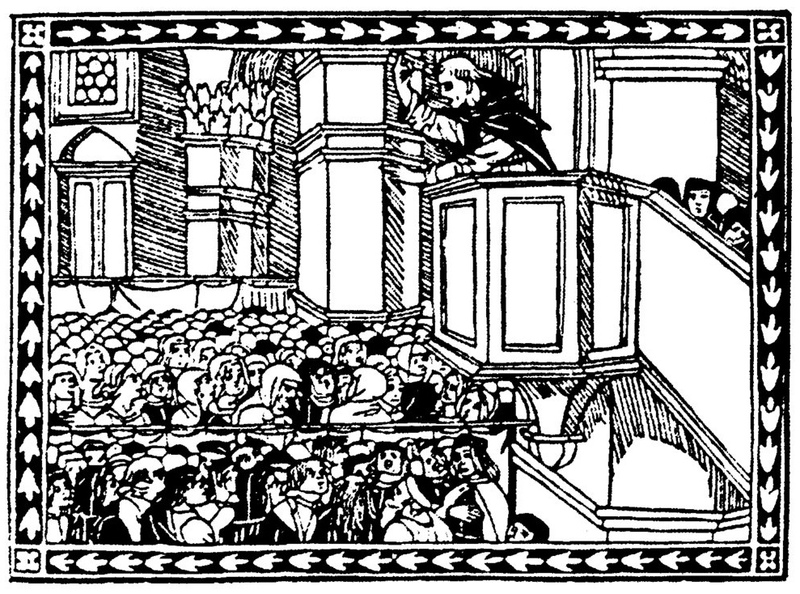 The former movement was the action of religious power to return to the situation before the pivotal point (1500). The latter style expression aimed at subjective feelings, which had emerged as an act of frustration and rebellion against the oppositional and ‘balanced’ setting of the time. Michelangelo left Florence for good in 1534 and settled in Rome. Pope Paul III appointed him to Superintendent of the Vatican Buildings. Michelangelo also gave advice on the rebuilding of the municipal palaces on the Capitol (see fig. 710). The year 1546 was very busy when he was asked to complete the Palazzo Farnese, redesign the St. Peter and continued the replanning of the Capitol in Rome. By now, Michelangelo had developed ideas, which might fit into a ‘Fourth Quadrant’. The struggle with symmetry and balance is over, once the conflict is viewed in the light of higher division thinking. Joachim LANGHEIN (2005) gave, in an interesting essay, a summary of this position: ‘Beauty always has holistic qualities, since it is constituted by a figurative balance of order in diversity. Beauty lies in ensemble effects, and proportion has a key function in constituting them because it guides the intermediation between order & diversity, together with other unifying principles’. Michelangelo spent, pursuant to this insight, the last eighteen years of his life meditating on life after death. 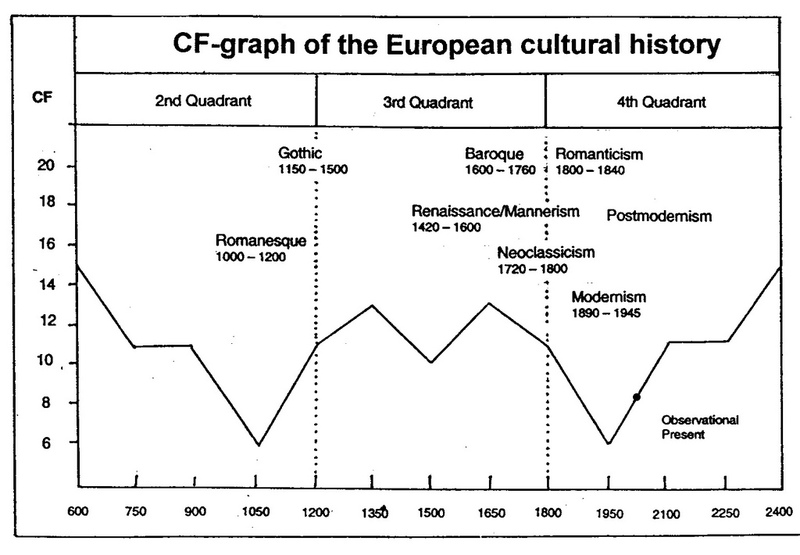 The various style periods in the European cultural history can be placed on the CF-graph of the universal communication (fig. 824). The visible visibility period (X) of Europe is assumed to be from 750 – 2250. The expressions of (artistic) visibility in this period give an indication of the psychological setting of the European culture at different points in time. Fig. 824 – The style periods in the European cultural history as conceived in a conscious application of the quadralectic way of seeing. The observational present (OP) is the year 2009 (at the time of drawing this graph). The consciousness of seeing is, in many aspects, a philosophical subject. Questions of ‘consciousness’ reach deep into the heart of any scientific investigation and the valuation of architecture is no exception. The act of understanding the phenomena known to the human nature implies the knowledge of the valuation process of an observer. The German philosopher Martin HEIDEGGER (1889 – 1976) is possibly the most recent of the thinkers, who came close to a ‘quadralectic’ outlook. His books – like his main work ‘Sein und Zeit’ (1927) – are virtually unreadable for any layman, due to a self-created German terminology to catch the fundamental essence of Heidegger’s understanding. His message and the destination of his exploratory thoughts are, nevertheless, directly relevant. 1. The exploratory search for man in his ultimate essence resulted in an understanding of Dasein (being-there). His main work ‘Sein und Zeit’ (Being and Time) defines the human existence as an active participation in the world, or a ‘to-be-in-the-world’. This position of unification (togetherness) implies the presence of a nothingness to make a distinction possible. The quadralectic philosophy supports the view of man-in-the-world making its existence feel in a self-chosen definition of division thinking and respecting the boundaries derived from this choice. Human presence (in a quadralectic view) only materializes after the realization of two points of recognition (POR) on a universal graph, which is derived from the shift between two four-divisions (the CF-graph). 2. After he found the definition of Dasein, Heidegger reached further to develop the concept of ‘Being’, the way in which man reveals itself. This second phase was, in contrast with his first work, riddled with historical references. Heidegger felt sympathy for the early Greek (Ionian) philosophers – like Anaximander, Parmenides and Heraclites – with their inductive way of thinking. ‘Being began to shine’ when these thinkers chose a single element (of nature or physis) to explain the world. Heidegger liked the Parmenidian concept of Moira (the generator of fate or destiny and/or the initiator of a mission), which acts as a source of revelation. ‘Revelation is the disclosure and the coming-forward from concealment’. This change (in visibility) can be compared in the quadralectic philosophy with a transitional move from the invisible invisibility (of the First Quadrant) into the invisible visibility (of the Second Quadrant) – which includes a choice in division thinking. Being comes into the open, but why Being breaks into openness, we do not know. This ‘Ionian’ treatment of Being led Heidegger to such conclusions that ‘not the thinker but Being determines the way of thinking’ and ‘Man is not the true author of his thought any longer, but only a missionary carrying out the words of Being in his thought-responses’. ‘Being’ (and its cross marked version, as a hint to nothingness) is placed – unfortunately without the specific mentioning of this mental act – outside the bonds of lower (oppositional) division thinking. The result is a position beyond subjectivism and objectivism. Being becomes synonymous with the (quadralectic) understanding of the term V (the length of a communication cycle – which is the result of an interaction between the observer and the observed in a chosen type of division). 3. The third and last phase of Heidegger’s thought is the establishment of an ontological stratification by four fundamental powers of Being: earth and sky, gods and mortals. Heidegger used ‘das Geviert’ (fourfold) in his later work (Vorträge und Aufsätze, 1954) as four domains, which form together the plurality and openness of the world. It is rather unfortunate that the choices of Heidegger’s Geviert consist of two opposing dualities, i.e. gods versus mortals and the sky versus the earth. Furthermore, the cyclic setting of the foursome is not accentuated, making the interplay of the foursome a cryptic event. Measurability, which is the very hallmark of conscious Being (or non-Being), is not applicable in Heidegger’s order. However, what is the meaning of plurality, openness and participation, if their extent cannot be measured? The conclusion has to be that Martin Heidegger entered deep into the phenomenological world and did important discoveries in this newly developed terrain of higher division thinking. The concept of Da-sein as the transcendental representation of man as an assembler (of its own visibility) is breaking fresh ground. The quadralectic observer, within the boundaries of a self-created graphic universe, has a direct bloodline to Heidegger’s assembler. The consistent development from Da-sein into the openness of Being – as it took shape in the post-Sein und Zeit period after 1927 – is, in the quadralectic philosophy, reflected in a measurable unit of communication (the length of the communication cycle). The graphic representation and its arithmetical genesis (in shifting four-divisions) offer a much clearer view on the character of Being than Heidegger’s vague notions to describe man in his ultimate essence. Finally, Heidegger came close to the building stones of the quadralectic philosophy with the introduction, in his later work (after 1954), of the double-dialectic of the foursome (Geviert). These domains were supposed to supply, by way of an endless intersecting mirror play, the coordinates wherein the world as a world happens. But how? His stratification had, essentially, a linear character with no hind to any form of a cyclic approach. He missed, therefore, the possibilities in a quadralectic communication of calculation and measurement, which are embedded in the genesis of a universal communication graph. No doubt Heidegger should get the credit for the above-mentioned advances in philosophical thinking, but it is also fair to mark the limits of his philosophical progress. In the end, Heidegger reached short of entering the exciting world of quadralectic thinking. The notice that ‘man must become the shepherd or guardian of Being’ is further evidence of the inherent static nature of his findings. His interest in building (Bauen – Wohnen – Denken, 1967) and his definition of dwelling as the ‘ultimate guarding of the foursome of things’ also points to a static situation. Quadralectic architecture, on the other hand, is a dynamic affair, where the (changing) interplay of the foursome has to be monitored all the time. The observer may only find the ‘truth’ in the continuous awareness of changing positions with regards to the observed. The rest is, like the dying Hamlet said, silence. Das Geviert – Anselm Kiefer (1997). From Bulletin of the Detroit Institute of Arts 89 (2015) – Das Geviert, 1997 – emulsion, acrylic, shellac, burnt clay, clay, wire, and sand on three panels of stretched linen or linen and cotton canvas. The architectural structure in this monumental painting was likely inspired by a brickworks that Kiefer saw while traveling in India. That building was in a perpetual state of construction and destruction: newly made bricks were stacked on top of it and then replaced as they were sold. Plumes of smoke suggest the fires within. Taken out of its socio-historical context, this building becomes an allegory of ephemerality. The stepped pyramidal form recalls the tombs of the Egyptian pharaohs, Babylonian ziggurats, and Meso-American teocalli, all remnants of ancient cultures. The words in the corners translate to earth (upper right), sky (upper left), divinity (lower right), and mortals (lower left), which are the fundamental elements of German philosopher Martin Heidegger’s (1889–1976) concept of “das Geviert” (the square), a hymn to dwelling on the earth articulated in “Building, Dwelling, Thinking” (1954). Consciousness of seeing – as a form of spiritual visibility – might be related to the Third Quadrant (III) in a communication. One step further there is self-consciousness, which seems – in a historical context – related to the ‘aftermath’ of a visibility period. It can be positioned at the closing stages of the Fourth Quadrant (IV, 3). John MOORHEAD (1992; p. 252) pointed, in the conclusions of his biography of Theodoric the Ostragoth, to the temporal self-consciousness of the period just after the demise of the Roman Empire. Cassidorius characterized Theodoric’s achievements as ‘surpassing the wonders of old’ and the writer often made a self-confident reference to ‘our times’. Theodorics’ reign (493 – 526) was marked by a consciousness of the achievements of antiquity. Architecture played an important part to visualize this notion. Columns and marbles were reused to the greatness of the present. Cassidorus frequently used the term modernus in his historical writings, and the Italian bishop and writer Ennodius (474 – 521) refers to his lifetime as a golden age (aureum saeculum) with an implicit attention to renewal (reparatio) and restoration (restauratio). The Ostragoth government tried to combine the conservative and innovatory. He succeeded in a form of continuity of the Roman empire, which had formally ended when Romulus, its last emperor-in-name, was sent by Odovacer to a castle in Campania in 476. These observations of a protracted fall (of the Roman Empire) and its association with a growing self-consciousness hold a message for any communication, which reaches the end of its (visible) visibility period (X). The third part of the Fourth Quadrant (IV, 3) is a time of ‘dualism’ within a quadralectic environment. The designated point where the visible visibility period (X) terminates is called LV (or last visibility; see the nomenclature of the CF-graph, fig. 852). The drama of this moment (‘the end’, ‘death’) is largely felt in an oppositional context. Egyptian and Roman classical history proves that such a moment in a communication is far less impressive in the world of higher division thinking. The consciousness of seeing in architecture – as a mark of visibility – should be placed at the position as given above, i.e. the third part of the Fourth Quadrant (IV, 3). It is possible, right before the ‘end’ of the visible part of the communication (X), to apply a four-fold measuring system, which uses the dualistic properties to make things clear. It is the period in any communication of a ‘final’ realization of visibility. The fruits of knowledge can be harvested. The European cultural period, as given in fig. 824, will reach the third part of the Fourth Quadrant (IV, 3) in the period from 2100 AD onwards. Comparison with other cultural entities revealed that Europe will reach, at that time, a ‘Late Renaissance’. Art and architecture will look backwards to times of glory. It is a fair chance that quadralectic thinking will be generally understood by the masses. The consequences in the visible realm are both spectacular and frightening. A dualistic search for greatness in the past is bound to fail. A look in the future offers no visible escape either. A new form of invisibility takes over in the fourth part of the Fourth Quadrant (IV, 4) when CF-values rise above the value 11. This airy and scary field of exploration, which cannot be described in conventional terms, is still an integral part of the communication-as-a-whole. The Oedipusian self-consciousness in the last phase of the communication cycle stages an act of departure between the observer and the observed. The touch with reality is lost in the closing stages of a communication cycle. Another observer has to define the next cycle. Architecture has to go all the way, just as any participant in a communication. All four stages of a quadralectic interplay between an observer and the outcome of building are part of the course. There is the realization of an unknown space before actuality took place, although no physical proof can ever be given because no boundaries were yet established. This primordial contemplation is followed by a world of ideas, ordered in the various forms of division thinking. Architectural ideas can materialize and offer a new kind of visibility in existing buildings. These physical products speak their own language, which can be communicated. The final chapter will give a glance in this new territory, which is only accessible to those who understand its quadralectic setting.